Fufu, (variants of the name include foofoo, foufou, foutou), is a staple food of West and Central Africa. It is a thick paste or porridge usually made by boiling starchy root vegetables in water and pounding with a mortar and pestle until the desired consistency is reached. 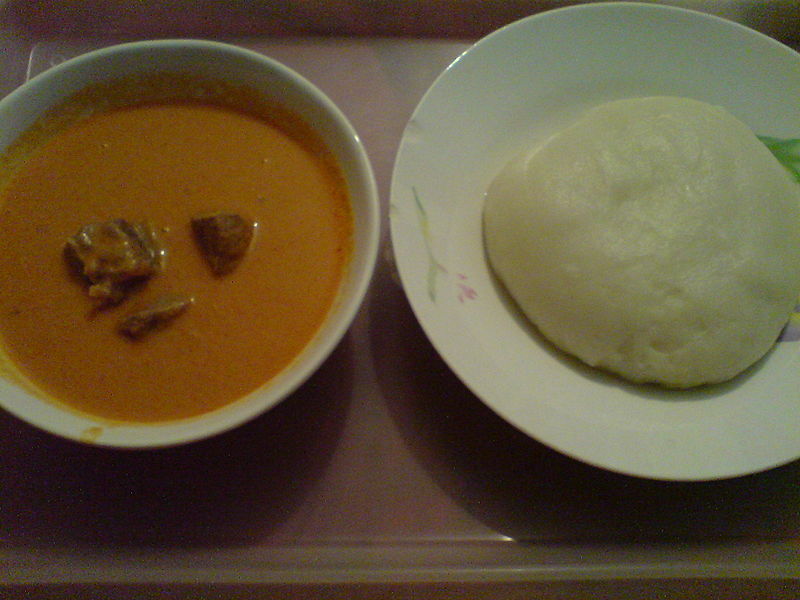 Left: A plate of fufu made from mashed potato and farina, accompanied with peanut soup. In the French-speaking regions of Cameroon, fufu is sometimes called couscous (couscous de Cameroun), not to be confused with the Moroccan dish couscous. In Western Africa, fufu is usually made from cassava, yams, and sometimes combined with cocoyam, plantains, or maize. In Ghana, fufu is mostly made from boiled cassava and unripe plantain beaten together, as well as from cocoyam. 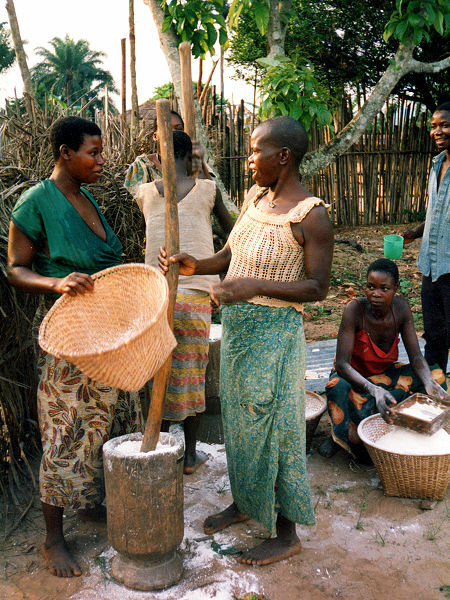 Left: Dried cassava root being pounded into flour to be put in boiling water to make fufu in Bandundu Province, Democratic Republic of the Congo. Currently, these products have been made into powder/flour and can be mixed with hot water to obtain the final product hence eliminating the arduous task of beating it in a mortar with a pestle. Fufu can also be made from semolina, rice, or even instant potato flakes. Often, the dish is still made by traditional methods: pounding and beating the base substance in a mortar with a wooden spoon. In contexts where poverty is not an issue, or where modern appliances are readily available, a food processor may also be used. In Western and Central Africa, the more common method is to serve a mound of fufu along with a soup made from okra, fish (often dried), tomato, etc. In Ghana, fufu is eaten with light (tomato) soup, palm nut soup, groundnut (peanut) soup or other types of soups with vegetables such as nkontomire (cocoyam leaves). Soups are often made with different kinds of meat and fish, fresh or smoked. The traditional method of eating fufu is to wash your hands then take a marble sized ball of fufu in the right hand. You then make an indentation in the ball and scoop up the stew or soup you are eating; finally eating the fufu itself. Therefore fufu not only serves as a food but also as a utensil.